For gentle cleansing of the face and body for newborns, babies and children with dry, dehydrated skin or skin subject to external aggressions. For gentle cleansing of the face and body of newborns, babies and children with dry, dehydrated skin or skin subject to external aggressions. Moisturizes and strengthens the barrier function of the skin. Softens skin and compensates for the drying effects of hard water. 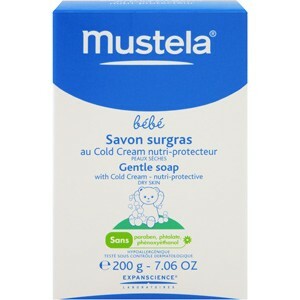 Contains Mustela's Cold Cream (glycerin, beeswax and ceramides), which creates a "shield" on the skin to protect it from environmental factors such as, cold, wind and dry air.